Mr. Kofman emigrated to the U.S. with his wife, Yelena. 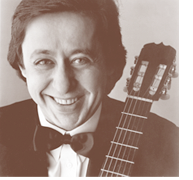 Upon coming to New York, he soon became a teacher at the American Institute of Guitar where he developed a friendship with many of the world’s leading guitarists, including such giants as Mario Escudero, Sabicas, and Jorge Morel. As a result, Kofman broadened his repertoire to include the vibrant flamenco tradition, as well as his own potent interpretation of the classical Spanish composers. He is also a graduate of the Mannes College of Music and, as a soloist, has performed widely: the NBC “Today Show”, WQXR, WNYC, and many other venues.